The big event this month is the total solar eclipse. 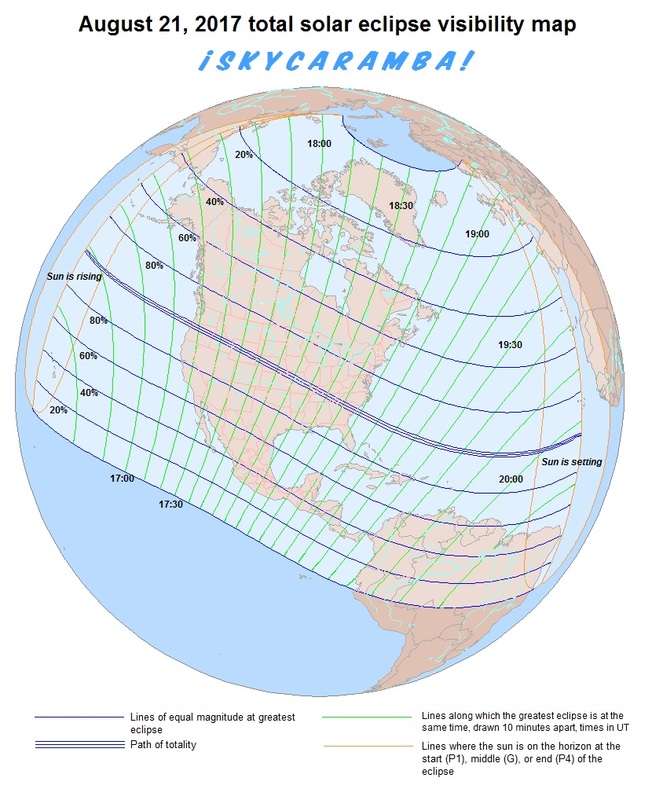 The path of totality runs from the northern Pacific Ocean, across the continental United States, and to the northern Atlantic Ocean. Partial phases are visible from just about all of North America and South America. The last time a central eclipse was visible from the continental U.S. was in 2012. It was an annular eclipse. However, it didn’t go all the way from the west coast to the east coast. For that distinction we must go all the way back to a total eclipse in 1918. If you are fortunate to be in the path of totality on August 21, you may have up to 2 minutes 40 seconds of totality. Southern Illinois and western Kentucky offer the longest total phase. But it’s nothing to scoff at if you’re in another area along the central path that’s not as overrun by eclipse tourists as those places are expected to be. Remember that the only phase of a solar eclipse when you can look at the sun safely without eye protection is the total phase. The halo that appears around the moon during this phase is the sun’s corona. It is plasma–hot, ionized gas–that is considered to be the sun’s atmosphere. Scientists who study the sun create their own miniature artificial eclipse inside a coronagraph to see it any time they want to. For the rest of us, we must enjoy the view during a total solar eclipse. At all other times during the eclipse, you must protect your eyes by wearing glasses made specifically for viewing the sun, by using binoculars or a telescope properly fitted with a solar filter, or by projecting an image of the sun to look at. Even when the direct view of the mostly eclipsed sun feels comfortable, you could let in ultraviolet and infrared rays that damage your eyes. Don’t use film negatives, sunglasses, or other dark materials that aren’t made specially for sun viewing. The time a solar eclipse is visible depends on where you are. 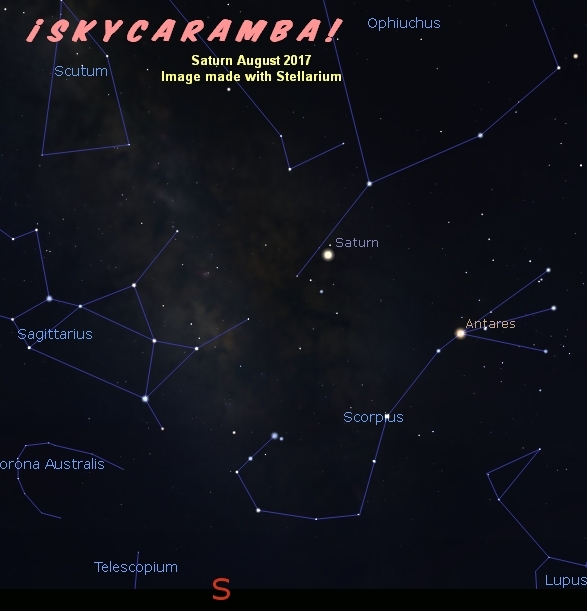 SkyCaramba has a clickable eclipse map to tell you when the eclipse begins and ends at any location. You may also put in your latitude and longitude manually. There is also a partial lunar eclipse this month. 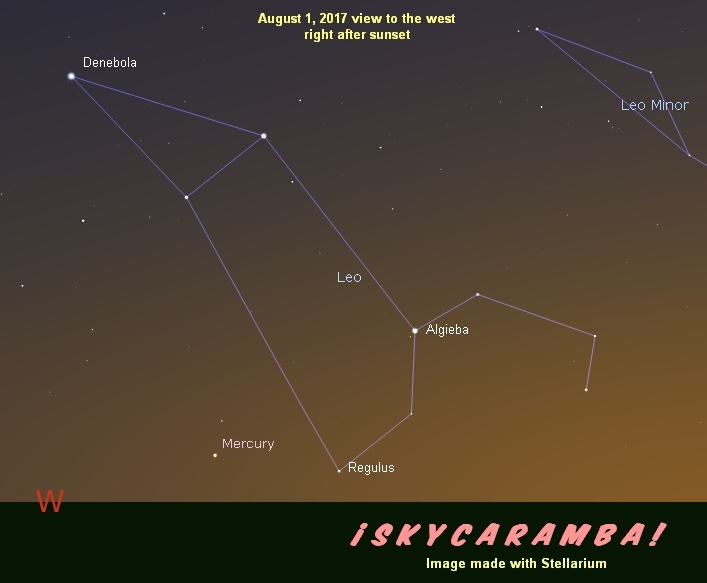 It’s visible on August 7 from Africa, Asia, and Australia. You can enjoy any part of any lunar eclipse without eye protection. The very beginning of this eclipse (the often unnoticed penumbral phase) is at 15:50 Universal Time. The partial phase starts at 17:23. The moment of greatest eclipse is at 18:20. Partial phase ends at 19:18. And the penumbral phase ends at 20:51. Of course, with a lunar eclipse on the 7th, that is when the moon is full. Last quarter is on the 7th. The new moon is on the 21st when the solar eclipse occurs. And first quarter is on the 29th. The moon is farthest south on the 4th, on the equator on the 11th, farthest north on the 18th, and on the equator again on the 24th. The moon’s at descending node on the 8th and ascending node on the 21st. Apogee occurs on the 2nd, perigee on the 18th, and apogee again on the 30th. Mercury starts the month in the evening sky setting with Leo. It’s heading sunward for inferior conjunction on the 27th. 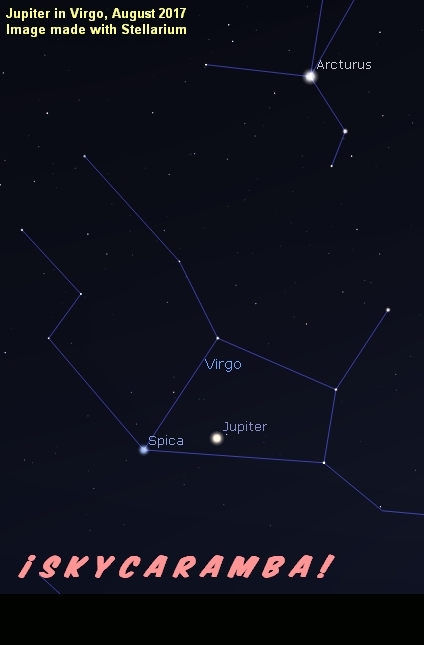 Jupiter is in Virgo at sunset. It’s in the southwest from the northern hemisphere. It’s moving closer to Spica this month. Saturn is at the south end of Ophiuchus close to the meridian at sunset at the start of the month. It’s a little farther west of it at sunset by the end of August. Venus is a morning object at the feet of Castor in Gemini when August begins. It has moved to the waist of Pollux by mid-month. 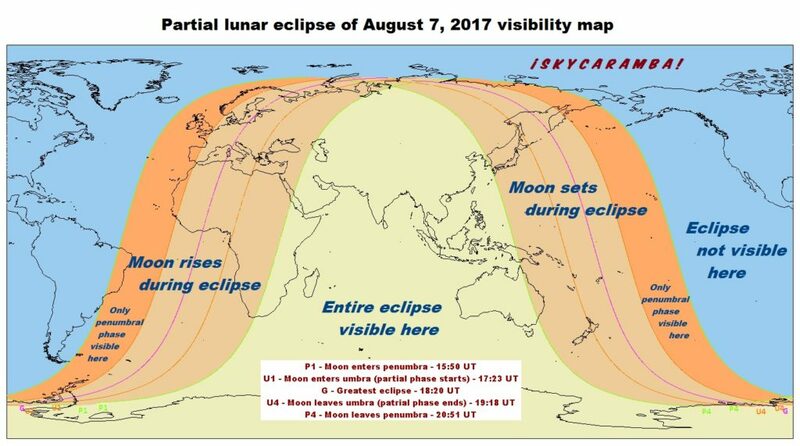 See the crescent moon pass by it on the 18th and 19th. You may think of this spectacular sight as a herald of the eclipse to come just days later. Mars is in the morning sky at the very end of the month. But it’s hard to see in the glare of the sun. The asteroid Flora appears 0.7° from Aldebaran on the 1st in the morning sky. Saturn and the moon are 3.4° apart on the 3rd. The moon passes 0.4° from Aldebaran on the 16th. If you’re in the right place, you’ll see the moon pass in front of the star. Most of the viewing area is in the Sargasso Sea area of the Atlantic Ocean. Some islands in the West Indies are included. So are Guyana, Suriname, and French Guiana. The moon is 2.2° from Venus on the 19th. As the moon is new that day, it would be hard to spot Mars 1.5° from it on the 21st. The more notable conjunction that day is of the sun and moon during the total solar eclipse. It may be interesting to know that a few hours after the moon passes in front of the sun, it will also pass in front of Regulus in a parallel and much wider swath to the south of the path of totality. Jupiter and the moon are 3.3° apart on the 25th. Mercury is at inferior conjunction (between the earth and sun) on the 27th. Saturn and the moon are 3.5° apart on the 30th. Mercury is at aphelion–the point in its orbit when it’s farthest from the sun–on the 2nd. It is 0.467 astronomical units (earth-sun distances) from the sun on that day. The Perseid meteor shower peaks on the 12th. You may also see some meteors for a few nights before and after. A rumor going around on the internet claims that this will be one of the most spectacular meteor showers ever. However, astronomers who actually study meteor showers are not expecting more than about 100 meteors per hour at the most. Light from the waxing gibbous moon will interfere, keeping the meteor count down. The Perseids come from Comet 109P/Swift-Tuttle. It orbits the sun every 133 years. Its last pass close to the sun and earth was in 1992. Every August, our planet goes through dust trails the comet left behind. Bits of comet dust strike Earth’s atmosphere and cause the molecules in it to glow as they streak through. Because light trails coincide with ionization trails, radio buffs including “ham” radio operators like to listen for distant signals that come in for a minute or two until the ionization fades.